This red plastic hand loom measures 7" × 7" (18 cm × 18 cm) and includes instructions and a weaving needle. Jersey Loops (No Longer Available) — Cotton Jersey Loops for crocheting and hooking techniques, in assorted colors. 16 oz (454 g) poly bag. 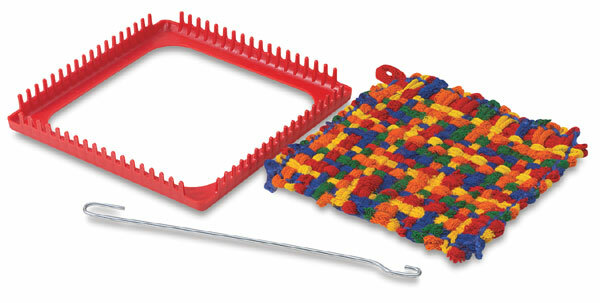 Nylon Loops — Use these colored nylon loops for crocheting and hooking techniques. Make your favorite designs with this package of assorted, vibrant, colors. 16 oz (454 g) bag.